August has been another great month here in the UK. I am afraid that my Canadian accent has picked-up some new British flavours, because my vocabulary certainly has… Now that I am on my way back to Canada this adventure seems to have passed by too quickly. This month has been jam packed with lots of new experiences. 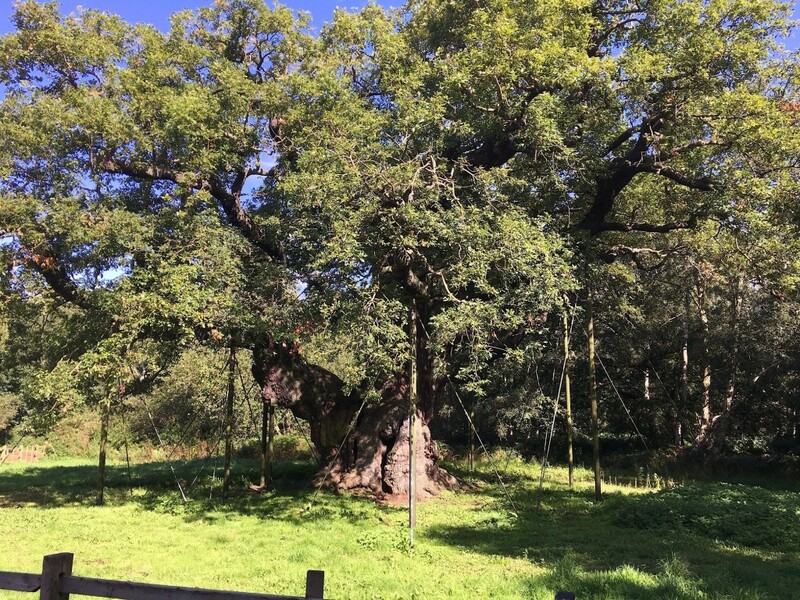 Some include, using an Arbortom (sonic-tomograph), visiting Thorpe Perrow Arboretum in Yorkshire, visiting the Major Oak (1150 years old), having my first Cromer Crab meal, and so much more. The theme for the month has been municipal based urban forestry and the challenges local governments face in regards to their street trees. Since arriving, I have been introduced to numerous individuals who are or have been involved with municipal urban forestry. Each person I’ve met has faced challenges that vary from one-another. Those challenges drift far from just tree related problems, including justifying economic spending politically, negotiations and even protests. It’s exciting, though, daunting to an arborist like myself who sometimes prefers talking to trees than to people. But all that aside, let’s get down to the nitty-gritty and talk about some soil! Above is the Major Oak in Sherwood park. Its 800-1000 years old. It is said that Robin Hood used this tree as a shelter during his day. Before I go any further I must explain the reoccurring issue of tree related subsidence. It seems to be the burden bestowed upon many urban foresters in the UK. Heavy clay soils in the southern part of England are a common quality of the surficial geology. An unfortunate characteristic of clay soils is that they can shrink significantly when changing from wet to dry. And, as we all know, trees require substantial amounts of water to grow and live (some more than others). When a tree is growing in heavy clay soils it can alter the moisture content substantially enough to cause the soil to subside, and when removed, the soil will heave In either case, trees growing in proximity to buildings with inadequately designed foundations can cause significant problems for home owners and Local Authorities In my final couple weeks, I was put on the case of a man with a hedge and a moat (two things I hope to have one day). The customer’s concern was, if they removed the hedge it may alter the moister content of the soils adjacent to their house and, like we now know, cause heave. After some soil extraction and assessment of the hedge its self, it was determined that it was very unlikely to cause damage to the house. The soil, though still very high clay content, still comprised of enough coarse-grained soil particles to not be shrinkable. The hedge was assessed to be not water demanding enough to significantly affect soil moisture. It was a valid concern, and was wise of the home-owner to have the soils assessed. The photo above is an image of a soil sample taken at a client’s house. In this case, the change in color as the sample got deeper is in correlation with the change soil texture. On the far left, you can see the shine that is gleams off the heavy clay. Early this August I was fortunate enough to get a meeting with the Peterborough Natural & Historic Environment Manager, Darren Sharpe, to discuss the challenges associated with managing the urban forests of Peterborough. He explained to me that Peterborough is what they call a, “Unitarian Authority”. This means Peterborough handles all usual municipal district services like, housing, planning applications, waste collection… etc. But, they also handle the county services like transport, highways, and education. Having the added level of responsibility of more services and covering more area, makes for the management of trees and wooded areas to become that more complex. The approach many municipalities take, including Peterborough, when dealing with such a vast number of trees is with an Urban Forestry Master Plan. A UFMP is a guiding document for all arboricultural and forestry operations within the municipality. For example, Peterborough doesn’t have any tree workers, they hire contractors who are obligated to follow the UFMP, thus creating consistency in the urban forestry work completed. Darren Sharpe explained to me, to further Peterborough’s engagement with their urban forests, they calculated their total tree canopy cover using LiDAR. LiDAR (Light Imaging, Detection, And Ranging) is a method a surveying, which, in very basic terms, is carried out with a laser strapped to an airplane that records vegetation cover. Having this survey enables Peterborough to understand their urban forests with more clarity. It also sets benchmarks that can be included in the UFMP. This approach is admirable. Typically, the use of aerial surveying is exclusive to commercial forestry operations. Applying these techniques to urban forestry, I personally believe, are steps towards managing our cities more sustainably. 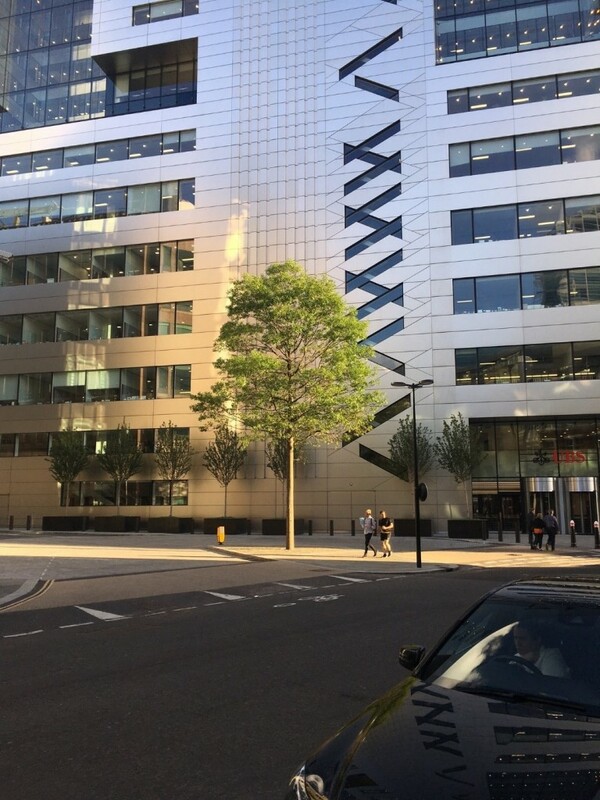 I visited two councils this month, one being the London Borough of Camden. I was greeted by the Head Tree Officer, Al Smith, and his team. The tour started off with Al taking me to the top floor of his office building to show me the extents of the Borough. He explained to me just some of the challenges a Tree Officer faces in one of the largest cities in the world. Which, as I guessed, are very difficult. London Tree Officers face some of the most complex urban forestry related difficulties imaginable. There are simple problems like pruning trees that have grown out of their boundaries, and there are complex problems like dealing with the damage an underground tube (subway) fire will inflict on tree roots, or managing the outcry of residents as mature trees are scheduled to be removed in wake of development. Al’s team consisted of five members who, with all strengths combined, formed a dynamic group that had the capacity to handle very complex problems. I saw this beauty on the way in from the King’s Cross Station. This tree is an excellent example of how trees are natural ascetic assets in the hustle-bustle of busy downtown streets. Two blokes can be seen basking in its glory. In one day, I got to spend time with each member. I could write an entire essay about each member’s position and still not cover everything I learned, but I will try to sum it up for you… First, I was introduced to the Camden tree inventory system. Each tree that is owned by the council, which is more than 27,000, has been inputted into a database along with its GPS coordinates. Any public claims, maintenance work, and billing history is attached to each specific tree which helps with quick access to a trees records if need be. On a side note, having a detailed tree data set, like Camden’s, gives Tree Officers the ability to conduct data analysis, leading to more informed management decisions. 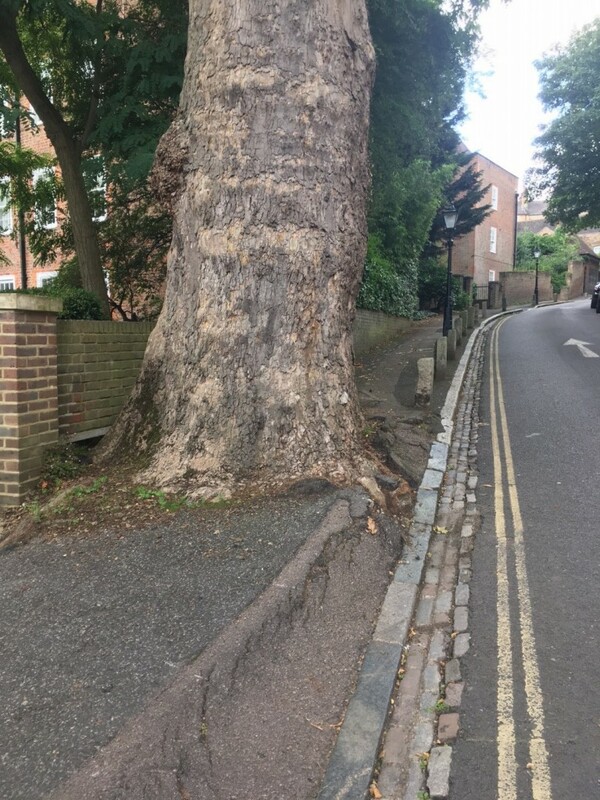 A basic analysis of the Camden’s data set revealed that the London plane tree (Plantanus x acerfolia) was one of the most common street tree in the Borough. Above is a picture of a London plane tree (Plantanus x acerfolia). It was huge, and rudely taking up the whole sidewalk! It goes to show the tolerance London plane trees have to grow in such unfavorable circumstances. The London plane tree is an amazing street tree that can withstand the toughest conditions. They grow very tall and provide generous amounts of shade for the city streets. Not to mention, they help to mitigate storm run-off during severe weather and clean the air of pollution and fine particulates more effectively than most trees. Great, right?! Well yeah, in a way. Unfortunately, there is pathogenic fungi that likes the London plane trees just as much as the Brits do. It is called Massaria fungus (Splanchnonema platani). It causes the top part of branches to decay and eventually break off. Sometimes in areas of high pedestrian use. Since it affects the top part of the branch, it is nearly impossible to detect from the ground level. 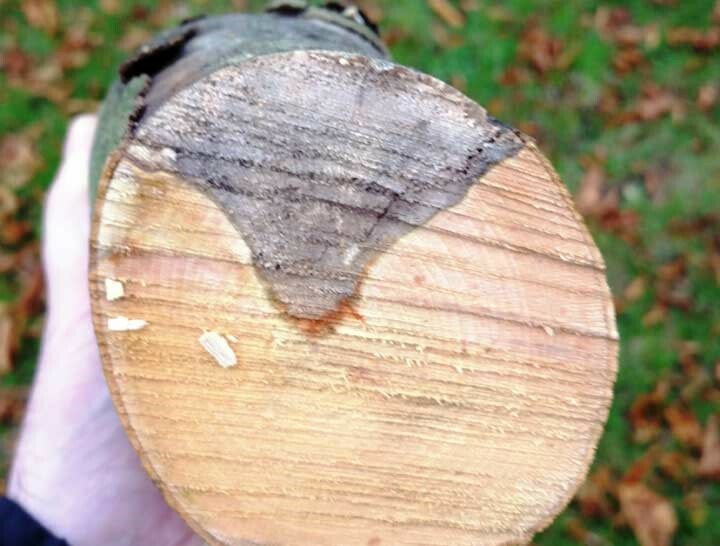 London Tree Officers deal with this problem by hiring professional tree climbers, or as they are known in the UK, tree surgeons, to climb, inspect, and remove any potential signs of Massaria fungus. As I saw it, the battle with Massaria fungus will be long-lived because of the prevalent but slow moving nature of the pathogen. Above is an image of how Massaria fungus (Splanchnonema platani) decays branches on a London plane tree (Plantanus x acerfolia). Another on-going challenge the Camden tree officers face is planting trees into the busy streets of London. 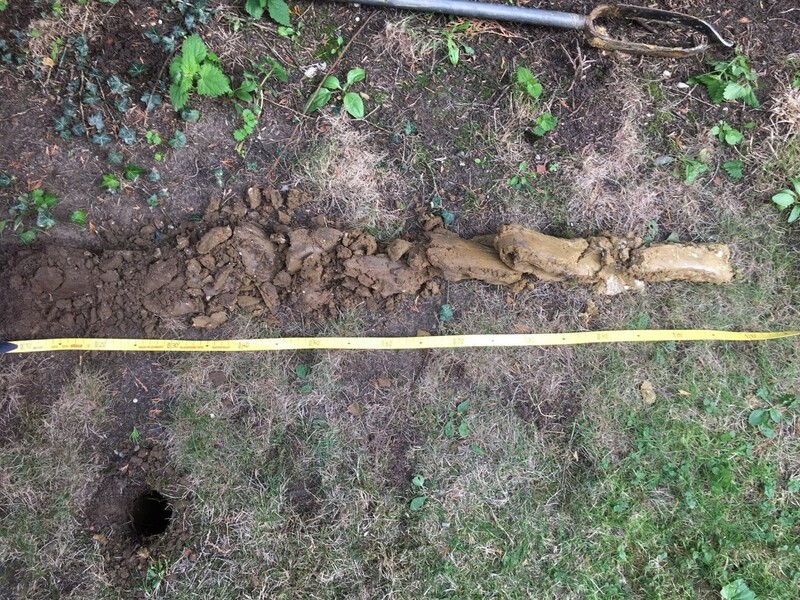 On top of having limited planting space, many areas in London are built on heavy clay soils with a propensity for subsidence or heave under the right conditions. With all these limitations, tree species selection in Camden is of upmost importance and carefully made. The species selected for heavy clay soils are low water-demanding species. One species I found interesting was a tree-form (usually a hedge) of photinia (Photinia spp.). More interestingly, Al explained that in certain areas people loved the photinia and other areas people were quite unwelcoming of the trees. In retrospect, the trees were kind of ‘cute’ looking, resembling a big green lollipop stuck in the ground. Why loved by some, and despised by others? I honestly couldn’t tell you. Maybe, photinia is going out of fashion… Overall, the visit with Camden Tree Officers was incredible! I will treasure the tour, as a fantastic professional asset in my continued development. I would like to thank Al and his team, Dave, Colleen, Kelly, Ben, and Ricardo for having me and sharing their knowledge (and treating me to easily the best Indian food I have eaten). Cheers! When I accepted the Prince of Wales Forest Leadership Award I didn’t know what to expect. I guessed I would be doing lots of urban forestry related activities and probably learn a thing or two along the way. I thought I might make some good connections to my personal network of urban foresters. But, as I sit here in the Gatwick Airport waiting for my flight back to Vancouver, it has started to sink in. In these past three months, I have made some of the best friends anyone could have. I am forever thankful to the team at AT Coombes Associates Ltd for taking me in and going out of their way to share their passion of arboriculture and urban forestry with me. Even more, opening their doors, including me in their personal lives, and introducing me to their lovely families and friends. I would like to personally thank Andrew Coombes for extending his hospitality beyond international borders and making sure I had the best experience possible, or as he would put it, “Just keeping Reg off the streets…” Andy has become an inspiration to me, with over 50 years in the industry, his knowledge is bottomless, his business sense is distinguished, and he is a charismatic leader. Ironically, almost miraculously, John Denver’s ‘Leaving on a Jet Plane’ has shuffled into my playlist and is making this wait for my flight rather emotional. So, to stick with the British expression of the ‘stiff upper lip’, I best wrap it up. For any other forestry or urban forestry students out there, I highly recommend you apply for the Prince of Wales Forest Leadership Award. Being the first college graduate to receive the award, I can say with first-hand experience, that even though the applications are selected from a range of education levels, it is entirely possible to stand out from the crowd. For now, I am starting at The University of British Columbia where I am pursuing the Bachelors of Urban Forestry Degree. This is my final blog. Thanks to the Canadian Institute of Forestry, Institute of Chartered Foresters, TD bank, and the Duchy of Cornwall for supporting such a great exchange program!